Craggy, snow-dappled mountains; deeply grooved glaciers that burst into waterfalls; isolated, wind-ravaged national parks: this is Patagonia, one of South America’s most wild, yet mesmerising destinations. If you’ve been struck by the travel bug to visit this spectacular part of the world, look no futher: I’ve got you covered with where to go in Patagonia. Despite a definite surge in tourists visiting the region in the past decade, it remains an iconic symbol of the savage beauty of South American terrain and a rewarding trip for the intrepid few who venture this far south. Thanks to GapYear.com and Rough Guides’ “Passport to Write” competition in 2015 (here’s my winning entry if you’re interested), I finally had the means to visit with a 34-day overlanding tour, a trip that gave me plenty of ideas about the top places to visit in Patagonia. So where should YOU be going in Patagonia? From acapella-singing King Penguin colonies, to trekking at the end of the world, Patagonia was more than worth the wait and my feverish anticipation. It was a hard task to trim down my most memorable moments, but here they are: my list of where to go in Patagonia including personal favourite places in this spellbinding part of South America. 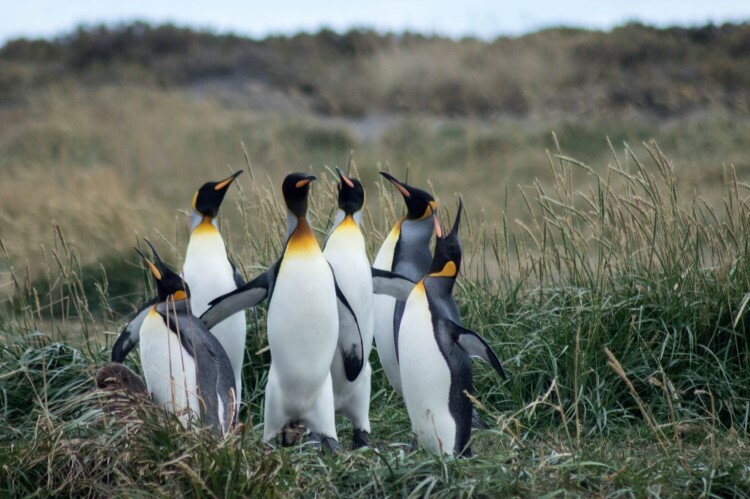 As an avid penguin lover since birth (and owner of a now rather battered looking, stuffed penguin called Boo), it should be no surprise that one of the most captivating experiences of my trip was our visit to the King Penguin Colony in Tierra del Fuego, Chile. Accessed by a road 15km south of the crossroads with the turn-off for Onaisín at an entry price of CH$12,000, the colony has only been resident of this slice of private, coastal land since 2011. Local conservationists and scientists have since taken over the site to ensure that the birds are protected and the colony’s development monitored, as well as offering informative sessions to visitors. Although this introduction to the colony was very educational, I was less than enthusiastic about the furry coat taken from a now very dead juvenile penguin which had been stapled to a board and is offered to tourists to touch. With the colony having grown in number since the original group of 16 penguins who settled here, visitors are now treated to a wonderful display of penguin daily life – albeit from a distance of a few hundred metres (to avoid scaring the penguins and causing them to begin attacking their own young). It was a surreal but utterly magical experience watching – and listening – to the group, many of whom spent most of their time “singing” and succeeding in belting out more noise than you’d find at your average karaoke. My personal favourite moment was the “acapella” group whose photo I snapped as they warmed up their vocal chords. It was a surreal but utterly magical experience watching – and listening – to the group, many of whom spent most of their time “singing” and succeeding in belting out more noise than you’d find at your average karaoke. My personal favourite moment was the “acapella” group whose photo I snapped as they warmed up their vocal chords. Another highly anticipated feature of the tour was our trip to Parque Torres del Paine; the stunning Chilean Patagonian landscape featuring powder blue glaciers and the infamous, rocky towers (or “torres”) from whose looming presence the park takes its name. One of the most visited hiking routes, it definitely ranks highly on the list of where to go in Patagonia, with most coming here to walk the “W” (a W-shaped trek that takes in the park’s “heavyweights”: Las Torres, el Valle de Francés and Glacier Grey). 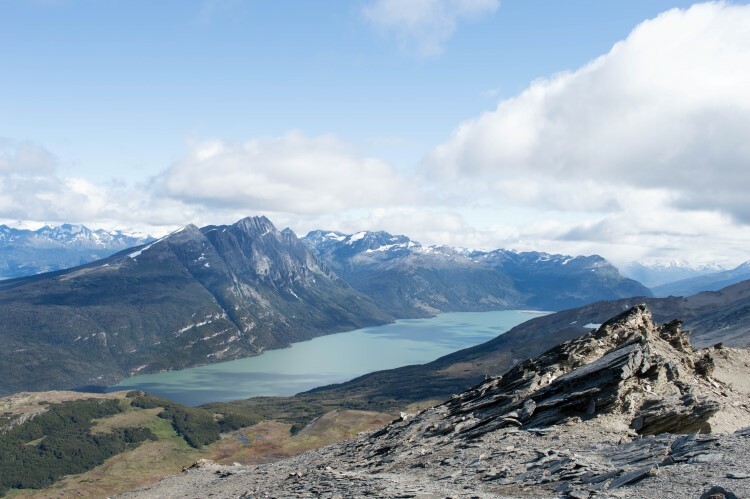 As a gentle four- or five-day trek with serviced campsites en route (where you can even rent a tent), it is certainly one of the more accessible ways to experience the stunning Patagonian scenery (read here how you can trek the W without a guide). While our tour unfortunately only gave us the opportunity to do this standard route, the other, less-known possibility is the “Circuit” or “O”. Covering a distance of around 87 miles, it takes in the back of the park, including splendid views of ice fields and a much-reduced volume of tourists. 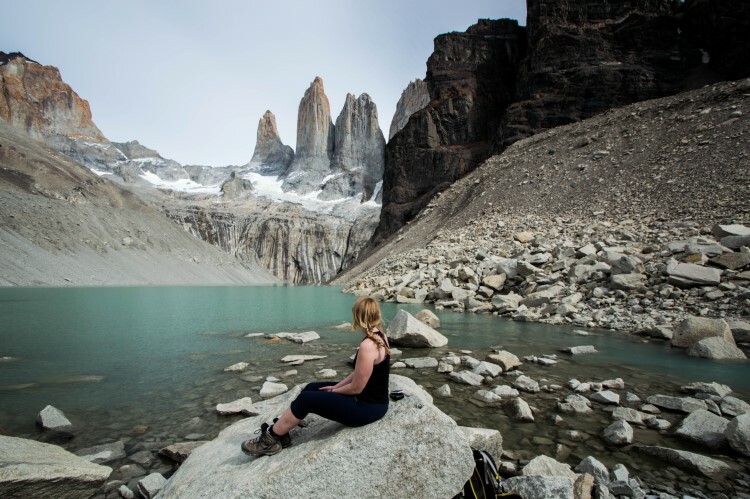 Although I enjoyed the hike – and particularly eating lunch at Los Torres on the final day – it’s easy enough to do both hikes without a guide, and I would certainly think about returning to the park to take on the seven-ten day circuit. (which I did in March 2017! Check out my guide to what to pack for hiking the Circuit in Torres del Paine National Park). A surprising addition to my top list of highlights in Patagonia, La Cueva de las Manos (or the Cave of Hands) is a remarkable, 13,000-9,500 year old set of cave paintings close to the town (not the glacier) of Perito Moreno, Argentina. The stone walls of the main, and several, smaller caves are littered with inverse hand prints: paint made from natural minerals is believed to have been blown through hollow animal bones to create the effect of spray-paint. 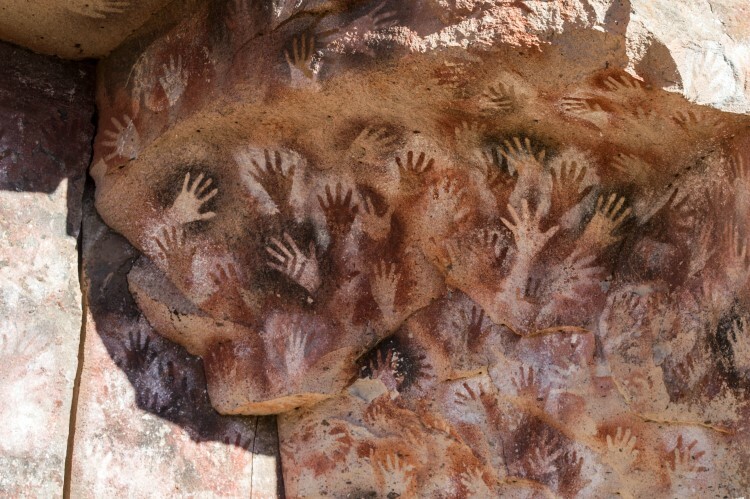 There are literally thousands of ancient hand prints and whose changing styles and forms mark the varying artistic tastes of the different tribes who over the course of almost 4,000 years made this, presumably, sacred place their home. This incredible mural features additional images of guanaco hunting scenes (an animal similar to the llama), representations of the sun, and slightly trippy, enormous Shaman images. There’s also the fascinating inclusion of a number of six-fingered hands, as well as the outlines of tiny, baby hands, which those working at the site assume must have belonged to children of significant tribe members. A designated UNESCO World Heritage Site, it’s certainly worth the detour from the main road and the entrance fee of around $80 Argentine pesos (£4). The guides are also very informative – although you’ll be lucky if they speak much English. A definite must-visit if you’re in the area. Ushuaia – the town known as “The End of the World” – is fairly miserable in places. Let’s face it, the incredible profits garnered from the trips to Antarctica which depart from here are clearly not experienced by the locals, but despite this, the nearby Tierra del Fuego National Park is certainly one of the top places to visit in Patagonia. There are a number of well-marked routes, and your entrance fee ($310 argentine pesos or £15, payable at the guard station at the entrance of the park) covers a booklet containing information about the different options. We chose to hike the most difficult, which would take us up to the spectacular viewpoint of Cerro Guanaco. Not for those with vertigo, the 950m climb over roughly three short miles involves a very steep final stretch covering loose rock and fairly unpleasant sudden drops to your right-hand side. But arriving at the summit and being treated to stunning views of the Beagle Channel and the surrounding mountains (plus the resident fox), made those moments of dicing with death completely worth it. For a specific guide to the route, check this one out. Like anywhere in South America, Patagonia is no different when it comes to the fluidity of time. I learned this again when I took the passenger ferry/cargo boat from Puerto Montt to Puerto Chacbuco. Although the boat was originally scheduled to leave at 8am, we were told that boarding had been pushed back to 2.30pm, and it was only upon arriving at the boat that I noticed the sign stating the time of departure would be 8pm that evening. Cue five hours of watching the ship being loaded (admittedly quite interesting as the vessel’s primary purpose is cargo transportation) and enjoying the sunshine when the heat of its rays occasionally managed to cut through the brisk sea air. Despite this, the Navimag ferry was certainly an interesting way to travel deeper South into Patagonia, and definitely worth the £43 (including food) that I paid for the ticket, which included an upgrade to a far nicer cabin than the 12-bunk dorm I had bought. Hooray to travelling in off-season! 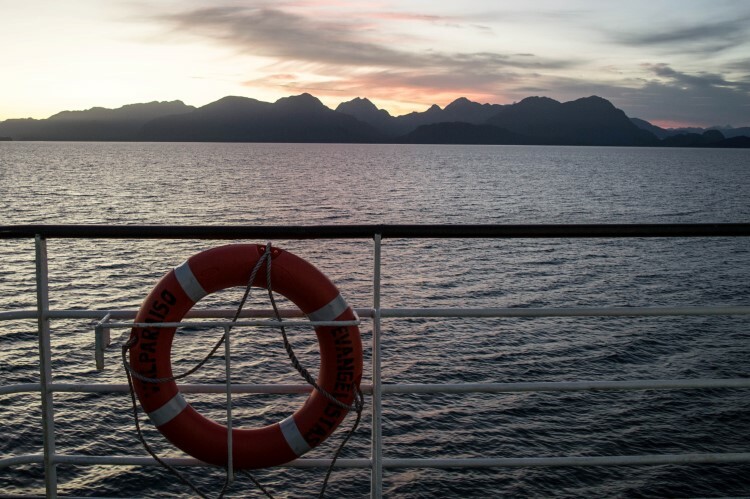 Unfortunately I had no control over the weather, which meant that while sunrise was spectacular, the following 12 hours were shrouded in a drizzly, grey haze that kept me indoors and peering meekly from the portholes in the canteen. I have on good authority that if you get cloudless weather, the views of the volcanoes and snow-doused mountains along this part of the Chilean coastline are delectable, and there’s a good chance (particularly in April, the final month in which the boat operates) of getting a glimpse of whales leisurely passing the boat. That said, there is an alternative to this boat, which I only learned about later in my trip. Find out how to see this stretch of coastline cheaper and with a better guarantee to wildlife in this post about whether the Navimag ferry is worth it. Visiting Patagonia – or South America – perhaps wouldn’t be complete without scaling one of its many impressive, and often active volcanoes. Falling to peer pressure from my travelling friends, I succumbed to the CH$85,000 (£85) price tag to climb Volcán Vollarica. Sunrise from the base of the mountain (you start climbing the 2,800m mountain from the path at over 1,000m) was fairly spectacular, although having to pay an additional CH$10,000 (£10) for the ski lift to skip the initial 300m ascent over loose, volcanic dust (which no one had mentioned) was not. Despite this, the climb was novel given that crampons and ice axes were needed for some sections, and thanks to our visit (late March) coinciding with when the volcano is most active, we had impressive views of lava spitting from the main crater. The real fun was sliding down purpose-sculpted ice tunnels with tiny plastic sledges attached to our bums and our ice axes serving as brakes and extra speed all in one. I thoroughly enjoyed the experience, but I know that similar hikes in Peru, Ecuador and Central America can be had for a much lower price. 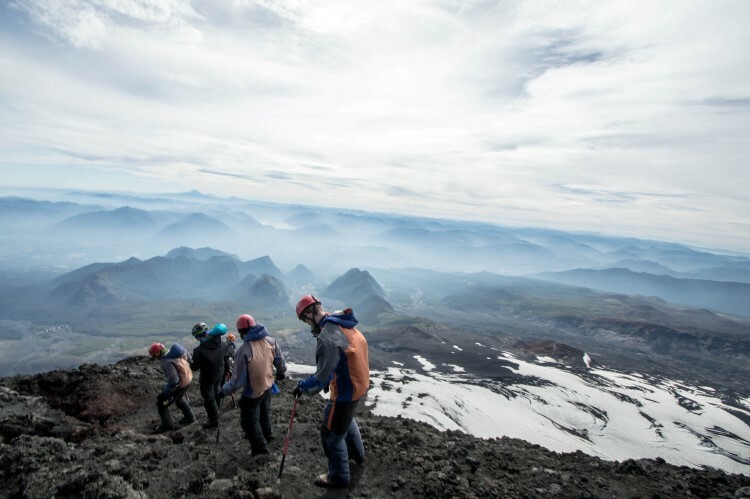 If you’re in Chile and this is likely one of the only chances you’ll have to climb an active volcano, it’s probably worth it. Although be aware that even towards the end of the season, there are still hordes of people climbing this mountain, and the queue of bodies snaking their way up the volcano makes the walking slow and frustrating at times. I’m not convinced it’s up there with the best hiking in Patagonia, but it certainly made for an entertaining day. 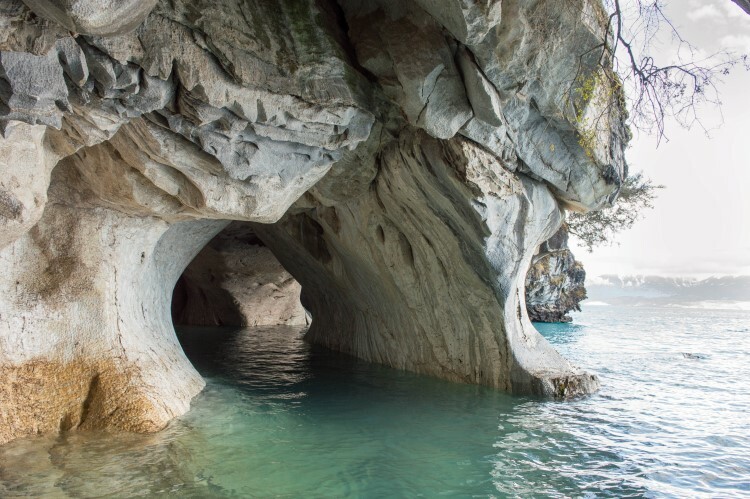 This had been top of my list of where to go in Patagonia before I started, and the stunning Cavernas Marmoles (Marble Caves) didn’t disappoint. Accessible from Rio Tranquilo, this one-horse town lives up to its sedate name (or at least if you visit out of peak-season), but does have stunning views over Lago General Carerra (the second largest lake in South America and one straddling the border between Chile and Argentina) where the caves are found. There’s not much else to do here unless you have a lot of cash to blow on visiting the nearby San Rafael Glacier – purportedly one of the most impressive glaciers, and fastest retreating, in the whole of Patagonia. Feeling my budget still stinging from my volcano trip, I was happy to settle for the CH$8,000 (£8) boat trip to visit what drew me here in the first place: the strange, icy blue of the glacial, meltwater lake and the weathered caves that line its edges. Taking a boat (or a kayak tour if you’re feeling flush) allows you to get close enough to touch the strange, dappled marble – that’s apparently a few million years “undercooked” when compared with the marble that we conventionally use. Seeming to change colour according to the temperament of the weather, both the faint, bluey hue of lake and the veined greys, blacks, whites and blues of the caves are spectacular. Which other destinations have you visited which should be on this list of where to go in Patagonia? Help me out with your suggestions by commenting below. Found this article about where to go in Patagonia helpful? Inspire others and PIN IT! Thanks Magdalena! I hope you have fun on your adventures if you do get the chance to visit Patagonia!